Some have been calling it a new route. Some more accurately a variation to the standard SW ridge on Ama Dablam. Personally, after only being up there three years in a row and far from an expert, I believe the route below the Dablam is just inching it's way to the right every year. The Dablam is no doubt getting smaller and with that, the face below it is becoming more scoured. Far more rock and hard ice are now exposed but the line is essentially the same. I've never seen such a mess of old, older and ancient lines before. The photo hardly does it justice. In the future I foresee more of the same. It will take a strong collaboration between teams to push a line around the Dablam. Hats off to to boys who did it this year. Very strong climbing indeed. With all that said. The SW ridge on Ama Dablam is about as classic as a route can be. The variation of climbing. Rock, ice, snow and mixed; combined with the mental exposure on one of the worlds most beautiful peaks makes Ama Dablam a must climb. All of the worlds peaks are are slowly falling apart, that's why they are so beautiful. The question is: How do we get up to their top's and back down safely? Care, teamwork, skill and most of all, a small ego. Maybe walking before one runs? 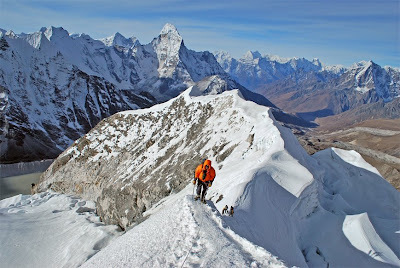 Zangbu Sherpa, Damian, Neal, James, Chris & Lahkpa Sherpa summited 6856m Ama Dablam at apx 12 noon on November 23. After acclimatizing on Island Peak, we rested for a day in BC. We then moved to c1 and slept. 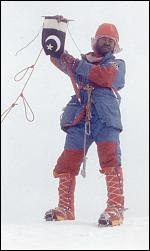 Next we carried some gear to c2 and descended back to c2 Then up to c3 and to the summit the next day and back to c3. Yesterday we descended to base and here we are. I have to mention once again how important and necessary the help of our local Sherpa staff was. Tsering, Pasang, Zangbu & Lahkpa worked so hard and without them, the climb would have been a totally different story. I'd love to hear more praise for these guys and girls. These unsung heroes always seem to get the generic "...and Sherpa" mention. Also, Nima Sherpa, from Su Swagatam trek, our local operator who runs our local logistics and so so much more. Hats off to anyone who climbs without Sherpa support on these big hills. Very proud indeed. Anyway, Neal, Dale, Damian, Noel & James are headed over to climb Lobuche in a couple of days with Lahkpa & Zangbu in the lead. My seemingly endless drive seems to have ended. And, along with a few frozen digits, I am in desperate need of some rest below 4000m. Nothing serious, just a sign that after 6 months on expedition, it's time for some, pardon the pun, down time. Chris from Ama Dablam base camp. We're headed for the top! The November Ama Dablam team summited Island Peak yesterday morning at about 8am. Everyone is feeling great and we are now headed for Ama Dablam base camp. Island Peak was a very busy place yesterday and despite a lot of egos, inexperienced climbers and territorial sherpas, we managed to stay focused and have an amazing day in the hills. Leave the egos at home people, have fun and play safe. And, for future reference, when you decide to take down a fixed line, please be sure no one is rapping on it!!! We are now acclimitized and hope to make a swift and safe summit push after a day or so of rest. We have camps 1 & 2 established and will be also setting a camp 3 in a safer spot lower on the mushroom ridge. I likely wont be able to write again until we are back at BC so please stay tuned. Hello from Ama Dablam Base camp. The November FTA Ama Dablam team arrived at base camp this afternoon. We plan on spending tomorrow packing for our acclimatization trip to Island Peak and sharing some skills on the fixed rope course I've set up. Three Polish climbers summited today and according to their Sherpa, the AD route is in great shape. There are only a few small teams here right now and base camp is more beautiful than ever. Everyone is healthy and happy. Damian, Neil, Noel, Isabel, Dale, James and I are all excited for the fantastic days to come. The November team is headed for Ama Dablam base camp and everyone is doing well. 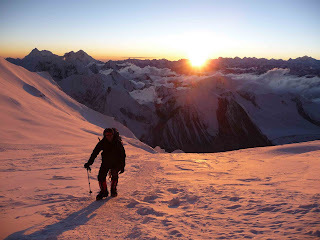 We will first go to Ama base camp then on to Island Peak once again (my 4th trip there) for an acclimatization climb. We are having some technical difficulties with our COM gear but i hope to iron this out in the days to come. I will do my very best to keep all interested parties up to date in a timely and accurate manner. We have a excellent team and we are all getting along great. I have a good feeling about this group. It's just one of those things. A bond between strangers that forms in times of challenge and adversity. Working together to build a team of brothers and sisters who will be there for each other on the hill and beyond. These bonds last forever and for some, the friendships formed in these high and dangerous places are some of the most steadfast and lasting of all. Field Touring Alpine guides Chris Szymiec, Sean James and Josh Kass summited Tharpui Chulli at 10am on September 26th. Josh and I left high camp at 4am and were later met by Sean and Dorje Sherpa who were intending to fix the snow face for the rest of the FTA members. We soloed up the 50 degree snow face while Sean ran out 200 meters of rope right up behind us. Once on the ridge we managed to convince Sean to tag the top with us (and break trail). The three of us stood on top at 10 am and were back at high camp by 1 pm for a nice lunch. The rest of the FTA team and Sean, were planning on heading up the following morning. They had great weather but i have no word on their summit push as of today. Josh and I went from the summit all the way to Annapurna Base Camp in a knee banging 16 hour push! This included breaking down high camp moving all of our gear back to Annapurna camp. It was a tough climb for Josh and I. Despite the relatively low elevation of 5663 meters, we didn't have the luxury of a porters to carry our gear up the mountain for us. It was a great experience being totally self sufficient on the hill. All are well at various spots on the mountain. Lhakpa, Tsering, Stu, Italo, Lyngve and Justin are at camp 2 for the night of the 24th. Beb and Guy H slept at camp 2 on the 23rd. All will head down to base camp on the 25th for a few days of rest in preparation for the summit push. Antonin, Kit and Erik are still on their acclimatizing schedule. Much more news to come in the next few days. First and most importantly our entire team - staff and members - are safe and sound in one place or another on the hill. We have been having some technical challenges which are now resolved and we hope to have more detailed notes in the weeks ahead. On the 20th all of our team ws in ABC enjoying an afternoon of cards, wilderness medicine classes, soups and hot drinks, except for Anthony and Sonam two camps below in CBC. Anthony had not been acclimatizing well at ABC and descended to CBC with Sonam for a few days and they are already headed back up and are expected on the 22nd. We have had a great run on the hill after our arrival on the 15th. To arrive required spending the 12th and 13th acclimatizing at Chinese BC (4700m) with a great day walk to 5400m, an easy 4- 5 hr road walk to Intermediate BC (5200m) on the 14th, and finally a much more demanding 5-6hr morraine climb to our home for the next 23 days. After a rest day on the 16th Lyngve, Guy H,Justin, John, Guy L, Italo,Tsering, Lhakpa and Ian took a load carry to C1 at 6400m and returned with tales of steep scree slopes and slippery morraines. Ben, Erik, Kit and Stu made their load carries on the 17th and cinfirmed the beauty of the climb and the treacherously icy walk back. Lyngve, italo and Justin spent a horrible night at C1 on the 18th with winds which destroyed tents for a few teams and left us making repairs of our own. We kindly refer to one of our tents now as frankenstein! After waiting out the wind for a day we are now returning to the hill with Kit, John, Stu, Ben, Guy H and Guy L headed up today (21st) and most of the rest tomorrow. Antonin will have to see how he feels when he gets back and make a plan then. Erik has a bit of a cold and may delay coming up by a day. We hope to all have 2-3 nights in C1 and one night in C2 (7200m) before returning to ABC for a 2-4 day rest before our first summit bids. With luck we'll be on top around the 30th Sept. Rob and Ryan are on a similar shedule for tye moment and will be spending 21st-23rd in C1 and C2 getting ready for their push on the south face. Our ABC camp, which sits high above an enormous bleached white glacier and faces opposite the sweeping and storied Nangpa-la, gives us a perfect view of the entire mass of Cho Oyu to our left - and an all to clear view of the entire route wewill need to follow! Our physical plant consists of 16 yellow VE 25s sleeping tents, two giant bright-blue house-shaped tarp tents (one for our chef Ratna and his staff Siddhi and Sonam and the second for our team to eat and gather in), a well used red outhouse tent and a highly prized burgundy shower tent. I take the time to mention these colors as they are the only breaks for the pallette of the upward-looking eye save the startling blue sky rejgning over the black, white and grey of the rock, ice, snow, scree, morraines and glaciers which make up our world here at 5700m. At our feet we are treated to an entirely varied world as the geologic story unfolds with every step in a language marvelling but escaping most of us. Metamorphic, igneous, sedimentary rocks abound with fossil, crystals, semiprecious stones everywhere tempting one to collect unreasonable amounts of souvenirs to bring home! Nearly everyone of us wishes we had taken geology classes to open up the stories locked up before us. 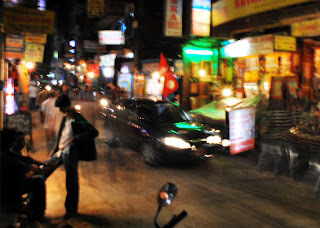 Our journey to this time has been quite remarkable and when we return to Kathmandu we hope to be able to enliven our notes with a long report and loads of images. We spend much of our time talking about home and we send our love to family and friends. We miss you all very much! Signing off for a few days and look to report in again on 24th or 25th. Cheers from the sunny beaches of thailand...er um, that is from the remote and austere himalaya! Stu just sent this message to the US office. All members and staff safely reached base camp on the 15th. Carries to camp 1 are underway. Camp 1 has been established (3 tents up there now) and they expect members to spend the night there on the 19th. The weather is cooperative with a mix of snow and sun. The rest days are spent admiring the extraordinary views and playing card games! More news in the days to come. Hi all, kit here in tingri. We arrived here yesterday after a long drive through the tibetan plateau from nylam. We had our first sight of cho oyu on the way in so have seen our challenge for the first time. the snow capped mountains and dry tibetan plateau make for spectacular scenery , everyone is pleased that our goal is in sight. The team is well though a couple of cases of gi and cold symptoms mean we will have an extra day here for recuperation and extra acclimatization. We had a couple of walks in nylam up to 4500m and will do the same today, possibly up to 4900m hopefully getting some good views of cho oyu on the way, though may be too cloudy for that. On a side note I am currently sat at 4600m overlooking the plains, which are vast and pretty awe inspiring, chatting with stu, ben, guy and antonin. Sun is breaking through and its nice and warm, nearly sunbathing weather. We are watching the rest of the group race up the slope ahead trying to be the first to the top...... I know where I'd rather be....I may just have a nap and wait for them to descend. We'll be moving on to chinese basecamp tomorrow so this afternoon is a final chance for a warm shower, for a while at least anyway! This email has been sent from KPMG LLP, a UK limited liability partnership (which is a subsidiary of KPMG Europe LLP), from KPMG Europe LLP or from one of the companies within KPMG LLP's control (which include KPMG Audit Plc, KPMG United Kingdom Plc and KPMG UK Limited), together "KPMG". KPMG Europe LLP does not provide services to clients. None of KPMG Europe LLP's subsidiaries have any authority to obligate or bind KPMG Europe LLP. This email is confidential and may be legally privileged. It is intended solely for the addressee. Access to this email by anyone else is unauthorised. If you are not the addressee or an intended recipient or have not agreed with us the terms on which you are receiving this email any disclosure, copying, distribution or any action taken or omitted to be taken in reliance on the contents of this email or its attachments, is at your own risk, prohibited and may be unlawful, and to the fullest extent permitted by law KPMG accepts no responsibility or liability to you. When addressed to our clients any opinions or advice contained in this email or its attachments are subject to the terms and conditions expressed in the governing KPMG client engagement letter. Anything in this email or its attachments which does not relate to KPMG's official business is neither given nor endorsed by KPMG. All members now assembled here with antonin arriving late last night. We have one more day here with everyone expecting a good acclimatisation hike today and great views of shishapangma. Stu will give a bigger update later today once we can get in the internet cafe which seems to be full from dawn to dusk. FTA Cho Oyu 2008: Visa in hand and off for the border on the 6th! Wonka ticket of which there seem to be very few this year. community to be on th ehill this year a cooperative and successful one. days from chris in Kathamndu! It snowed 35cm last night at camp 3. The wind was blowing a gale and despite our desire to finish off this big climb, there was no way we could possibly go anywhere but down. We were the only ones left on the mountain and the descent today was epic for some. Everyone is safe and sound at camp 2. 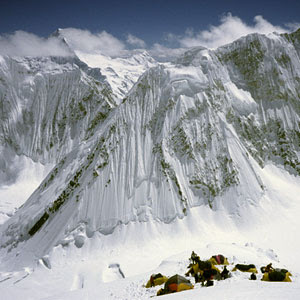 We will move down base camp tomorrow morning and sadly, conclude the climbing portion of this expedition. Like I always say, the mountain will always be there. We all arrived in camp 3 yesterday after a grueling climb up from camp 2. The early morning snow conditions were excellent but as the day progressed and the slopes steepend, hot temperatures made the climbing very taxing. After our arrival at camp 3, Ian, Paul, Lukasz & Myself made the decision to wait a day before attempting the summit. There are about 30 climbers here right now and they all made an attempt for the summit at 3 am this morning. Among them was Michael and Taqui from the FTA team. The whole group turned back at 6600m in thick fog and deep snow. It's snowing right now with zero visibility. If the sun comes out this afternoon and we get a good freeze this evening... And if the weather forecast is wrong we will make another attempt at 12 midnight. All of the other expeditions have left camp 3 and are currently returning to base camp. It's just us at 6300m, 2 tents, 6 guys and 1/2 days food. We've arrived at camp 2 and all is well. The weather has been very bad as of late and we are doing our best to stay positive and healthy. There is supposed to be a window of clear weather starting today, but alas, it's snowing like mad in the middle of August. This morning Me, Taqui, Ian, Paul, Michael & Luksaz had a late start from camp 1 and headed up in great weather. The route was covered with about 15cm of fresh snow and I had the privilege of breaking trail up the wonderful ridge, jumping crevasses and kicking steps through amazing terrain. What a day at the office! Tomorrow the team will rest at camp 2 and myself and Johnas from the Spanish group will finish fixing the route up to 6400m, just below camp 3. On the 20th, if the weather permits, we all move up and go for the summit the next day. Chris from Spantik camp 2, 5300 meters. Great news! The FTA 2008 Spantik team has all reached base camp at 4230M. Everyone is feeling great and we have already become great friends. We're having some very interesting conversations and heated debates on every imaginable topic. Luksaz, Usman, Ian, Myself & Paul arrived yesterday, the 8th and Michael rocked up this morning (he trekked in a day behind us due to a little GI trouble). We are all healthy and preparations for the 7027M climb have begun. Tomorrow we will do the usual gear checks, food sorting, packing and a little crevasse rescue training. The next day we plan to establish camp 1 at about 5150m and come back down to base that same day. After that, no one can say for sure. I promise to keep you posted though. There are about 6 other expeditions on the mountain so tomorrow afternoon the expedition leaders will meet to discuss how to make the situation work for everyone. It's crowded at BC but it's a big hill. Photo:7027M Spantik as seen on day 2 of 3 on the trek in. After one of the most stunning treks in the world, and nearly 90km as the crow flies, the 2008 Gasherbrum 2 team has arrived at our 5200M base camp. Everyone is in great health thanks to a good acclimatization schedule on the way in and excellent food prepared by little Karim and the rest of the cook staff. The weather has been a bit unsettled in the afternoons with scattered flurries. The mornings however offer the most stunning of views. Clare is celebrating her birthday today so we have our cook staff baking her a cake and serving a feast of mammoth proportions. We really have it good up here. Everyone is settled into their own comfy tent and the unpacking for the next 26 days has begun. Its a gear junkies paradise up here. After arriving today I ran out 250 meters of rope up and over some glacial formations for a skills review and gear testing session tomorrow in the AM We will rest in the afternoon and enshalla, head up to camp 1 at about 5800M the following day. We will then return to base camp for a rest. The base ice fall is very heavily crevased this year but it all looks very manageable, and interesting! The team is strong and we are all stoked to get on the mountain. ...the only problem: there is no shade! At 4am on June 26, the 2 HAPs Taqui & Asgar. The yellow rope: Chris, Andy, JR, & Francois. The red rope, Naucho, Mark, Fred & Surech all set out into the icefall for our first push to camp 1 on Gasherbrum 2. In the darkness and cold of the early morning, the ice fall proved to be quite straight forward with only a couple of off vertical sections. No fixed ropes were needed and the travel onto the upper plateau at the base of the Gasherbrum amphitheater was excellent. That is until the sun came out. Despite the most amazing of scenery, the temps quickly went from 5°c to 30°c, and this was at 7am! Nothing more than a massive solar oven walled with some of the tallest peaks on earth. 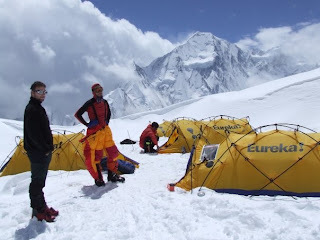 Taqui & Asgar reached Camp 1 about 2 hours before me and the yellow rope team. We dropped our loads and began to descend at about noon. The red rope had decided to stop about 200 vertical meters below and were resting while Naucho was setting an advanced basecamp and depositing his 25kg load! Crazy guy. Andy, JR & Francois took off back to basecamp and I waited around and descend with the red team. We all stumbled into base at about 5pm. The heat was nuclear and the icefall was much more challenging with the added dimensions of slushy ice and rushing torrents of melt water. Today we rest and prepare to set out at 2am tomorrow for our first sleep at camp 1. The weather is amazing so we may decide to spend a couple nights up high and try to establish camp 2 before coming all of the way down to base camp to recover. All is well and the base camp staff have really gone out of their way to make this trip a great experience. The food is amazing and after nearly 2 weeks, we haven't had the same meal twice! The long trek up the Baltoro Glacier is nearly behind us. The whole team is feelling great and we are now looking forward to a rest day at 4600m at Concordia. The views are amazing. K2, Broad Peak, Chogolisa, Gasherbrum 4. We are all awe struck by the stunning beauty of this place. Despite a possible porter revolt, we will stay here to acclimitze for a full day. Then it's a long days walk to our new home for the next month, Gasherbrum 2 base camp. We will be sending our climbing gear up to base camp tomorrow with the porters who have threatened to strike and despite their attempts at bribery, we will stay here to ensure we all aren't wiped out by the time we reach the start of the climb. Just part of the game up here. I knew things were going too smoothly. Photo: Suresh, Mark, François & Jene-René looking at the summit of K2. Just a quick note from the lovely Indus Valley and the town of Skardu. The majority of the team arrived via air this morning on what we all agreed was the most amazing flight of our lives. We has the most stunning of views of Nanga Parbat, Masherbrum and hundreds of the worlds highest peaks. We navigated through high passes with the summits brushing our wings. We all found it strange when the pilot announced "Ladies and gentelman, welcome to Skardu" before we had even landed. We took this as a sign that the danger had passed and the rest was smooth sailing. Unreal, gotta love Pakistan!!! Mark arrives in Islamabad this evening and will be joining us on the 12th, inshalla (Urdu for: If God permits). The rest of the team members will be relaxing on my orders and getting ready for the very tough trek ahead. Tomorrow i sort gear and drink three cups of tea with my old friends Taqui & Ashgar. Life is good and everyone is so glad to be in such a lovely place. On a personal note: Lindsay-Bea I (Chris) miss' you oh so much. Fred says: "Mary, your would love the farbrics over here" and im sure everyone else is sending their love and best wishes back at the hotel. worlds most revered treks to Gasherbrum 2 base camp. The big day is just around the corner. I am flying to Kathmandu on May 29th then onwards to Islamabad on June 8th 2008. Very exciting. I imagine that some of you have questions about gear items or travel stuff and may be looking for suggestions from Myself, Stu or other team members. Please feel free to access this blog website and post answers questions or suggestions. this is my first time using this blogger software but I feel strongly that it will work very well for us. In fact, I just discovered that we can send emails form Gasherbrum 2 base camp directly to this blog page. I encourage all team members to post comments via the 'comment' link below. Lets start blogging! photo: Sebastian, Chris in the down suit and Asgar convalescing at camp 2 on Spantik. Twan. This is a professionally organized and led expedition, that is partly guided. In that respect the leader provides the general support and maintains the logistics and safety support for the team, while it is expected that all team members be self sufficient at least on the low to intermediate slopes, and be able to undertake movement between the camps unsupervised. Those members that wish to undertake their summit bid in the company of the leaders will generally be able to do so, while more experienced climbers retain the flexibility to move independently. To be an eligible member on this expedition you must be very competent, and posses the necessary stamina and experience to be a contributing player in the ascent. Gasherbrum II is part of the greater Gasherbrum group of 5 peaks, 2 of which soar over 8000m, and is the world's 13th highest peak. She is roundly held as one of the most straightforward and accessible of the fourteen, and climbers on her normal route, if sufficiently resourced and prepared, enjoy good summit rates in clement weather. The climb is fully supported with the highest quality ground, base-camp, and leadership resources, and all group gear (HA and BC tents, tech gear, ropes, stoves etc) are included in the trip fee. This expedition represents an outstanding opportunity to be a part of an extremely well priced, expertly managed, and comprehensively resourced 8000m ascent.